Audials One 是最好的在大規模，快速，合法和免費的音樂檢索！只有 Audials One 可以監視成千上萬的電台，同時搜索互聯網上最好的音樂來源。這意味著它可以自動獲得所需的音樂，以最高的質量和驚人的速度，將其傳送到您的 PC 的硬盤，雲端或通過互聯網連接的移動設備上. 85 文件格式和 84 設備配置文件提供給您，以確保最簡單的使用。這使您可以復制和存檔音樂，視頻，有聲讀物，播客，電影和 DVD，並將其轉換為智能手機，平板電腦和遊戲機的正確格式。感謝 Audials One，複製保護和文件格式的問題已成為過去. - 10 times More Monitored Radios Boost your Music Supply! 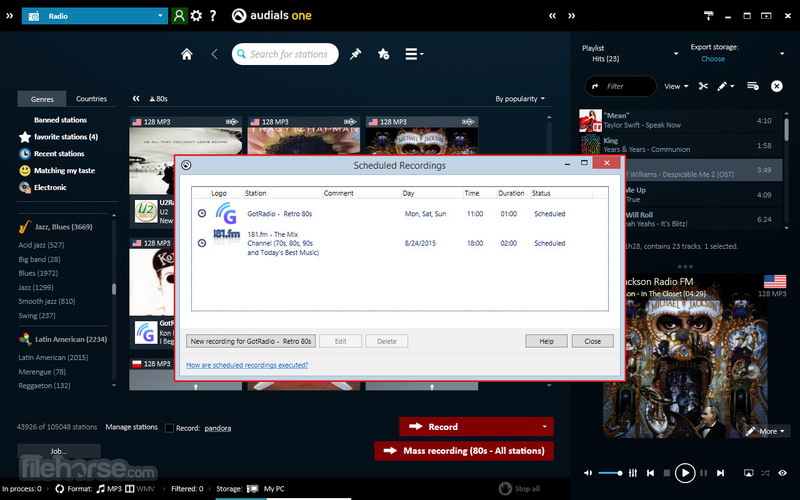 - Only the six-time software-of-year in the category music Audials One has a wishlist with which you can automatically record your music from the best Internet radios in a targeted manner. This has always existed only with Audials and is now however with 10 times as many radios in the monitoring much better! - There's no diet here! Dig in to more radio, more charts and more music! - Tell Audials your music taste (by giving it a reference song, for example) and Top Songs will create a playlist of songs that match your taste via the music search. You can play and download the hits individually or grab them all at once. And it works for music videos, too. This means you can get plenty of new music from Audials in a matter of minutes. Top Songs also works if you select a specific genre or artist. - Climbers, Popular Tracks or Evergreens? You Decide! - You can decide whether you want the latest hits, popular tracks or evergreens from a particular genre. You can also narrow your selection even further by specifying the release year. - What's Better than the Audials Charts? Even More Audials Charts! - The new software brings you the latest monthly Audials charts as well as all of the past charts for free, with 80 more added every month! This means plenty of top 10 hits from the rock charts, US music video charts, pop music charts, dance charts, US single charts, and 80s charts are now available at the push of a button as well as newcomer recommendations from Audials. With all of this music, you'll never be bored again! - Songs in the highest quality! 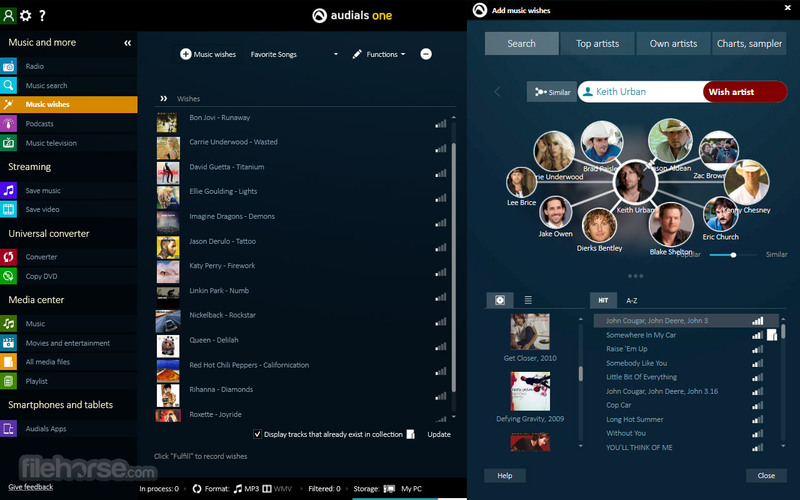 - Audials 2017 now provides studio versions of your music wishes from connected music portals or via smart radio recording. There are no live recordings, no presenters and no adverts – just crystal clear recordings like you used to get from a CD. Audials also gives you additional versions of a song as usual, of course, but the best version is now always the first thing you see! - Getting Music from One Wishlist is Great, but Several Wishlists at Once is Even Better! - And now for the main course. With several wishlists at once, the new Audials Radiotracker 2017 can satisfy even the greediest of music fans. 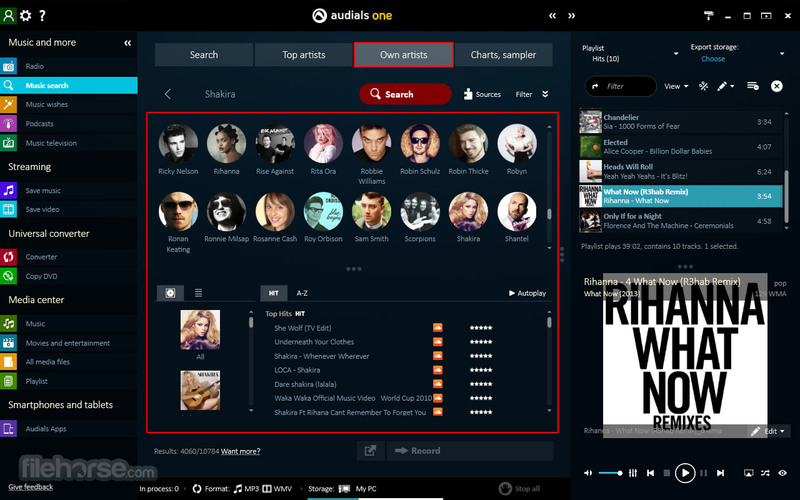 Simply create your first wishlist, maybe add the monthly Audials charts and another wishlist from the community and - voilà - your own personal menu is created and the best Internet radio stations are served. - Music Wishes now better than ever – clearer and easier to use! 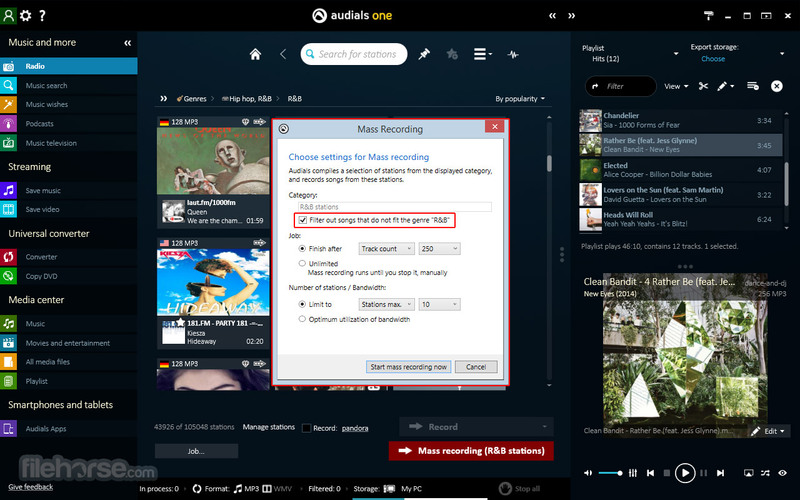 - We have already pre-selected the best settings in Audials to enable you to get the best music. This means all of your music wishes are fulfilled as quickly as possible and in the best quality! This is what we stand for and is the reason we also offer a money-back guarantee if you do not like our product. Of course, you can still change individual settings, but they are no longer as prominent as before. Instead, they are shown discreetly in a single background window. You now also get information on songs that are currently recording, songs that are still missing, and wishes that have already been fulfilled. 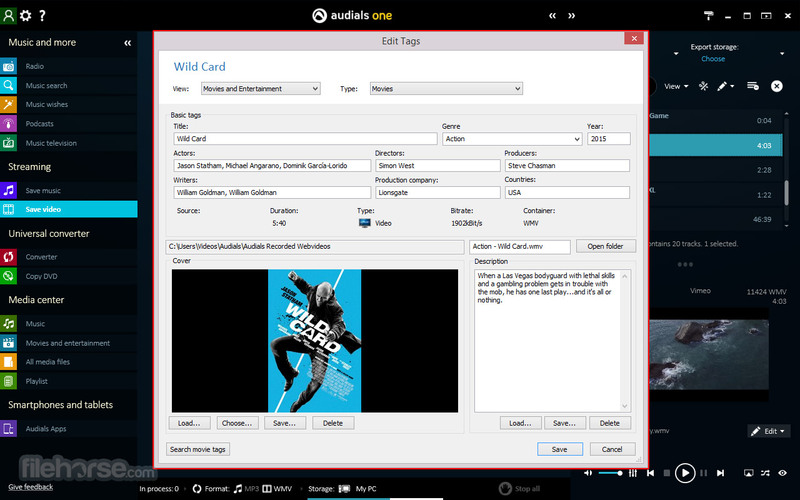 Audials automatically generates a playlist for every fulfilled wishlist, and you can immediately find every hit in the Media Center with a simple click. - Check Out the New Music Wishes Function in this Slideshow! You'll be Amazed! - A picture is worth a thousand words. We could spend a lot of time explaining all of the other things that improve your Audials experience, but you can just click on the button instead and enjoy the show! The table provided a compact summary of the functions shown in the slideshow. Audials.One.2018.1.49100.0.rar. Uploaded on 2018-07-11 14:52:46. Downloaded 1 times, size 146.7 MB. Download link; Code for forums; HTML code.